Bangalore, May 25, 2008: The BJP will meet Governor Rameshwar Thakur on Monday to stake claim to form the government. 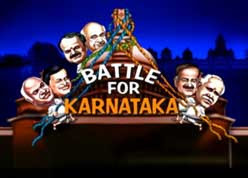 The BJP, which lost the 2004 General Elections and then the crucial UP elections in 2007, believes the victory in Karnataka marks its resurgence. BJP chief Rajnath Singh said the party’s victory in Karnataka was a milestone in its social and geographical expansion and made it the front-runner in the next Lok Sabha elections. "The natural conclusion after the Karnataka victory is that not only has our public mandate increased, the party has registered a social as well as geographical expansion," he said. "The BJP had so far been seen as a North Indian party. Now, we can say that the BJP is an all-India party," Singh added. Meanwhile, senior BJP leader Venkaiah Naidu said the victory in Karnataka would have “national implications”. “This is a breakthrough for BJP. This will be our gateway to the south and will have national implications. It should not be treated as a local victory as this is something that will help keep the party flock together and improve our performance for the upcoming state and general elections,” said Naidu. B S Yeddyurappa, the BJP’s chief minister-designate, said, "We have not won a clear majority but the verdict is for a BJP government."